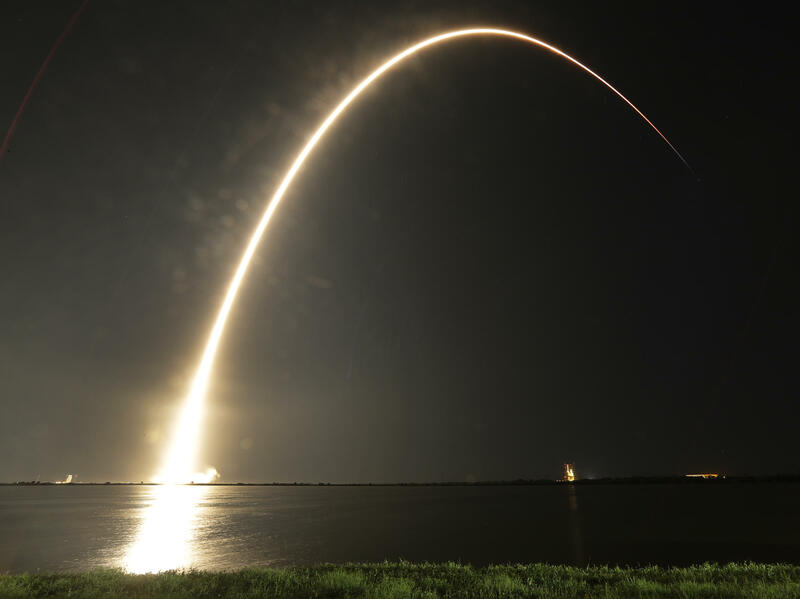 A Falcon 9 SpaceX rocket lifts off from the Cape Canaveral Air Force Station Complex 40 launch pad as seen through a time exposure in Cape Canaveral, Fla., early Tuesday. A SpaceX Falcon 9 rocket lit up the sky around Cape Canaveral Air Force Station in Florida early Tuesday with a successful launch, placing an Indonesian telecommunications satellite into orbit and demonstrating the reusability of the company's upgraded booster. You can see the launch here starting at 21:45 in the video. The launch marked the first time that the Falcon 9's new "Block 5" booster had been recycled following the improved rocket's maiden launch on May 11. SpaceX founder and CEO Elon Musk has advertised the Falcon 9 Block 5 as "the most reliable rocket ever built." The rocket's upgrades are aimed at shortening the turnaround time for recovery and reuse. "For instance, its grid fins, which are used for steering the rocket back from space, are made out of titanium, so they won't catch fire on the way back to Earth. The engines also have a new heat shielding to protect them from the high temperatures during the plunge through the atmosphere. And the structure that holds the engines to the rocket's bottom is bolted down now, not welded, to make it easier to take apart and inspect," according to The Verge. Reusability has been a key goal of SpaceX, with Musk insisting that it has the potential to reduce the cost of reaching space by a factor of a hundred. In 2016, for the first time SpaceX successfully landed one of its spent Falcon 9 boosters on a barge in the Atlantic Ocean and the following year reused the same vehicle for a second launch. Tuesday's launch of the 229-foot-tall Falcon 9 occurred at 1:18 a.m. ET when the nine Merlin engines of the first stage, producing 1.7 million pounds of thrust, ignited and the rocket gently rose from Cape Canaveral's Complex 40 pad. "The first stage pulsed cold gas nitrogen thrusters to ready for its descent, while the Falcon 9's second stage — powered by a single Merlin engine — ignited for the first of two burns to send the Merah Putih satellite into an egg-shaped geostationary transfer orbit. With the aid of grid fins, rocket thrust and four landing legs, the first stage touched down on SpaceX's landing barge around eight minutes into the mission." In February, SpaceX successfully launched its new Falcon Heavy, the largest and most powerful rocket since NASA's Saturn V, which took astronauts to the moon and was last flown in 1973. Musk says the Falcon Heavy is designed to carry humans and could be used for missions to the moon and Mars.